Dimensions 0.56 by 6 by 9.06 in. Amazon.com description: Product Description: FCC radio license exam preparation book for the 2014-2018 Element 2 Technician Class question pool. Contains all 426 Q&A reorganized into logical topic groups. Education, fun answer explanations have key words highlighted to help you learn and remember important aspects of ham radio. Fully illustrated with photos and diagrams to aid learning. Includes bonus "On the Air" audio CD containing the exciting sounds of Technician class ham radio operation. 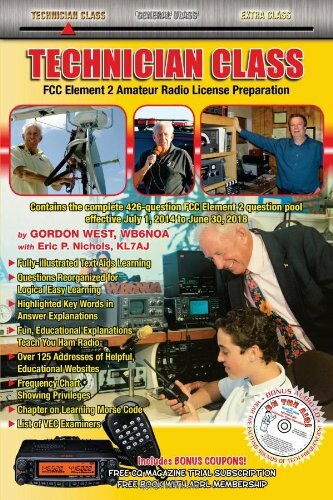 Book contains all of the information you need to know to become a licensed ham radio operator.